Heating Problems this Winter? Call for Repairs | Comfort First Heating and Cooling, Inc.
Too Much Dust: This is one we really like to underscore. It’s more than likely that you use a furnace to heat your home—it’s the most common heating system across the country. These systems are so popular because they’re efficient and cost saving. When your furnace starts to go under, a common sign of inefficiency is too much dust. Dust, dirt, debris, and grime start to circulate through your venting system on end. Pay close attention to the amount of dust in your home—it’s a big sign that you could have a heating problem on your hands soon. Strange Noises: Listen to your heater. Make sure that you take note of any odd sounds because they’re a sign of a problem within your heater. If you’re wondering what an “odd” sound from your heater is, it’s literally anything other than the sound of hot air moving through your venting system. Common heating noises that denote a problem are rattling, banging, grating, or squealing. Each of these noises’ points to a different problem—anything from a loose part to a malfunctioning blower. The only way to definitively know what the problem means is to have a professional assess your system. Short Cycling: A big sign of a problem is short cycling. Short cycling might seem a little innocuous until someone points it out to you. The term “short cycling” refers to your system starting, running for a short amount of time, stopping, and then starting again shortly after. Short cycling is hard on your heating system. If you let this cycle go on for long it runs your system into the ground and spikes your heating bill. If you notice this happening you need to call a professional as soon as possible. Lukewarm Air: Noticed that you’re turning the setting on your thermostat up higher and higher because you can’t get warm? Take a moment to stop and wonder why. It’s more than likely because of the quality of the air coming out of your heater. If you’re experiencing lukewarm air in your home then you need a professional team to repair your heater. 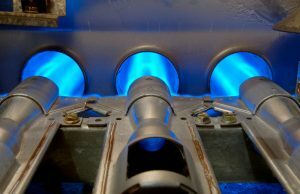 If you need great heater repair services be sure to call our team. Comfort First Heating and Cooling, where we put your comfort first!